This massive font bundle brings you a stellar collection of best-selling creative fonts, with huge variety and endless creative potential. The bundle includes creative extras packs, web fonts and fully extended licensing. This is your chance to enjoy a mix of classic, enduringly popular fonts, as well as all new best-sellers, all for 92% off. 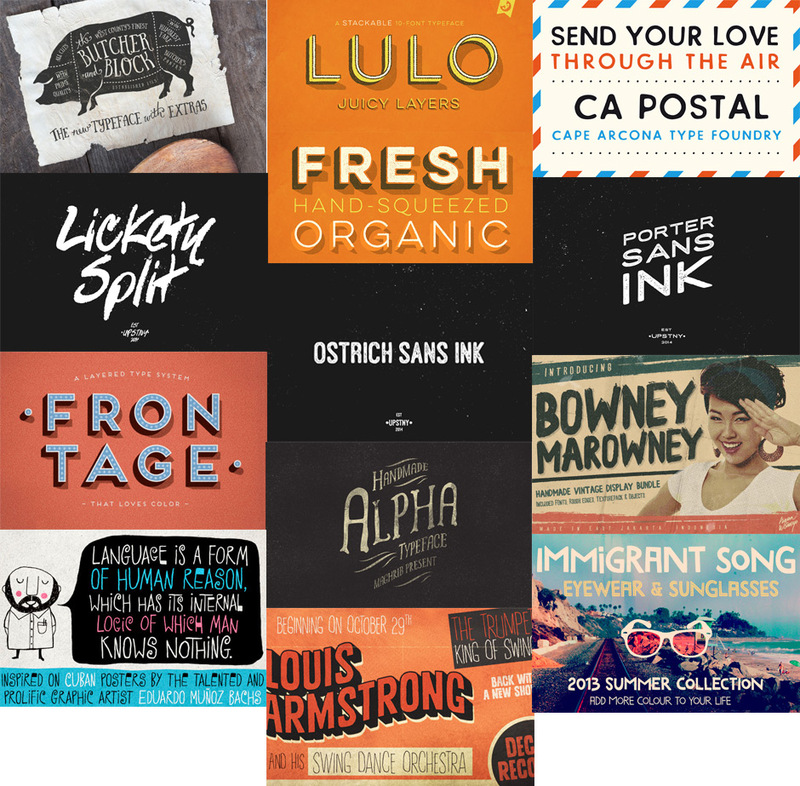 A massive collection of 12 best-selling creative font families and artistic extras. Our last font bundle was our most popular yet, so we really pulled out all the stops with this all new collection. We’ve taken on board your feedback, and put together a huge collection of 12 best-selling creative fonts. 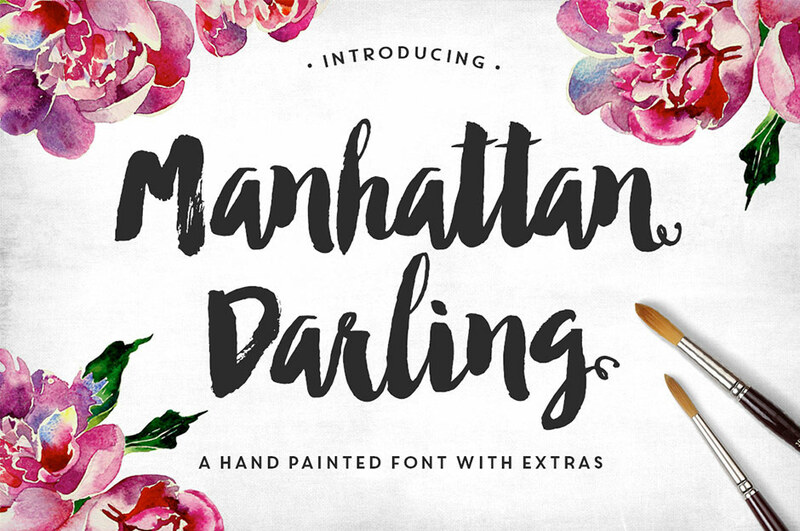 These fonts are seriously beautiful, and there is a ton of variety for you to enjoy. We’ve included some all time classic creative fonts (including some we’ve had our eye on for ages), along with some all new recent best-sellers (including an exclusive font launch from a very popular designer). Of course like always, we’ve included tons of extras, web fonts and extended licensing at no extra cost to you. Oh, and you can get everything for a whopping 92% off. 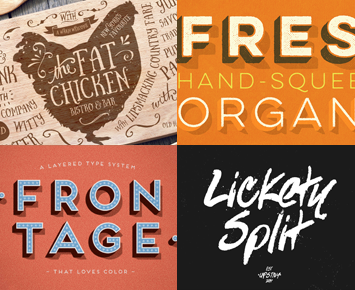 The 12 font families in this bundle are all best-selling, and really popular at full price. We really did our research for this bundle, and secured you guys the perfect mix of classic popular fonts, and fantastic new fonts on the block. We even have a launch special on a font from Yellow Design Studio. This is your first chance to own this brand new font anywhere! We all know that good fonts tend to be really expensive. Normally you’d be lucky to get one font of this quality for $29, let alone 12! We’ve squashed the regular value of these fonts down by 92%, making this the best value font bundle currently available anywhere. All fonts in this bundle include web versions, at absolutely no extra cost to you. These web versions would normally jump up the price, so to get them for free is a huge bonus. We’ve also included lots of extra resource packs, including textures, Photoshop actions and vector illustrations. As well as web versions, we’ve secured you the best licensing possible! There is an extended license on all fonts in this bundle. This means that not only are they OK for commercial projects, but you can use these fonts in items that you sell. The only restriction is that you cannot redistribute the fonts directly (i.e. : ‘as is’). Introducing the new Butcher and Block Typeface …..another carefully hand-made, quirky, versatile font, crafted with love :). 1.) The Butcher and Block font (.otf ) – this font contains uppercase letters, in two forms – one is accessed through the lowercase letters on your keyboard, and the alternatives through the uppercase letters on your keyboard. 2.) The Butcher and Block Extras font (.otf )- which includes 28 carefully styled, handy catchwords and elements to compliment your typography and make your designs pop. 3.) 30 New and Delicious Illustrated Vector Elements to help you build your typographical designs – available in vector, psd, and png. (Ai EpsCS, Ai Cs5, layered scaleable PSD , flat PNG). 5.) The original files for the ‘Butcher and Block’ Pork Typo Design (Ai,psd) AND the Fat Chicken Board Typo Design (psd) – so you can scrutinise over how its done, and create something similar yourself! I’m very excited to say that Yellow Design Studio’s new Lulo font is being launched here, exclusively as part of this bundle. Once the bundle has concluded, this font will be selling at it’s full price of $49. By grabbing it here, you’ll not only own it before anyone else, but you will also get it for a vast discount, as well owning the other 11 creative fonts in this collection. 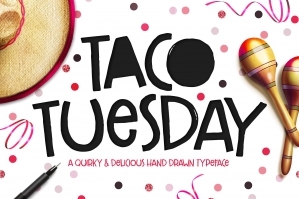 Lulo from Yellow Design Studio is a textured, retro, amazingly 3-dimensional font family. Endless effects can be created by adding different colors to each of the 5 stackable layers. Lulo is all-caps, and has subtle texture variation between the upper and lowercase characters so duplicate distressing in double-letters can be avoided. Other features include regular and bold weights, high-resolution texture that looks great even at large sizes, and extensive language support. CA Postal is a cute and clever little stamp-font. It was originally intended for a record-cover only, but when the artist wanted all lyrics printed in the booklet, it was time for a font. The initial inspiration was a moveable-stamp printing-set, which had a nice Futura-like style, being very pleasant to read, especially in small sizes. But of course it’s the loose and irregular outlines that give the font its special charms. CA Postal features two sets of characters and the “Contextual Alternates” feature will make sure that never two identical characters will stand next to each other, so that the stamp-look becomes even more authentic. Proud to share one of my most well received fonts! It was made by drawing each glyph on 3″x5″ index cards, scanning, tracing, refining, and testing. There is wide international support and a webfont kit is included in the download. An international, woodblock-type version of my font Ostrich Sans! 300+ glyphs in both regular and italic make this the best version of Ostrich Sans yet! A beautifully hand-printed look for an extended bold sans-serif font! While the font is technically “all caps” the uppercase and lowercase glyphs have different ink patterns. Download files include: TTF and OTF formats. The typeface’s design is based on a simple grid which creates the friendly, handcrafted look of facade signs. It is generously spaced for maximum impact of your message. As a display typeface Frontage loves color and is suitable for headlines and logotypes. Details include 224 characters in six styles and manually edited kerning. The complete family pack includes 5 Open Type fonts. Frontage 3D, Frontage Regular, Frontage Bold, Frontage Bulb and Frontage Shadow. Alpha typeface is taken from the Greek language philosophical.The meaning of alpha is the “first letter”. Where the first letter is the letter that was first remembered and always be the first place in the alphabet series.Similar to this alpha typeface, hope this font be the first choice font to use.alpha typeface inspired by the style of vintage hand drawn. There are 224 glyphs, to give Alpha a truly authentic hand-drawn feel. 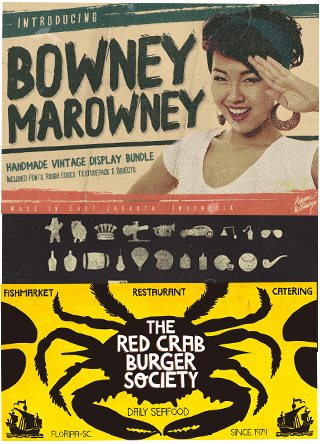 This is good for logo, labels, print for modern vintage feel, handwritten font by Maghrib. Extras pack includes 42 silhouette vectors and a really useful grunge Photoshop action. A thin rough handmade ink stroke, made from the bold markers written on the old paper so the edges are blurry. Available in OTF and TTF files with Uppercase, Lowercase, Numbers, Punctuations, Accents (Opentype Standard Encoding) with 200+ glyphs on it. My new bestseller product that contains 32 rough edges and bonus textures (.png format). Inspired on Cuban posters by the talented and quite prolific graphic artist Eduardo Muñoz Bachs, Transmogrifier was hand painted with a thin brush, using loose, fast strokes. This font is packed with lots of contextual and stylistic alternates that automatically transmogrifies 🙂 the letters as you write (opentype savvy programs needed!). You can also pick the alternates by hand and set the text the way you like better. The choice is yours, and there are really plenty of alternates to choose from and create original handlettered-looking designs. The font also brings a set of rough pictures based on charcoal sketches from Shniedewend & Lee Company, circa 1888. These were hand painted using the same thin brush as the letters, making them a natural complement. Unicode range: Basic Latin, Latin-1 supplement, Latin Extended-A. Glyph coverage: Basic Latin/English letters, West European diacritics, Central Europe, Baltic, Turkish. Languages Supported: Albanian, Afrikaans, Basque, Breton, Bosnian, Catalan, Croatian, Czech, Danish, Dutch, Esperanto, Estonian, Faroese, Finnish, Flemish, French, Fijian, Frisian, German, Greenlandic, Hungarian, Icelandic, Indonesian, Irish, Italian, Latin, Latvian, Lithuanian, Malay, Maltese, Maori, Moldavian, Norwegian, Polish, Portuguese, Provençal, Rhaeto-Romanic, Romanian, Romany, Sami, Samoan, Slovak, Slovenian, Serbian, Spanish, Swahilli, Swedish, Turkish, Tagalog, Welsh. Rather Jazzy, Rather Loud: a family of two quite distinct fonts that perform together handsomely well! Both fonts include 2 versions for each letter, easily reachable through keyboard upper and lower keys. They come packed with Contextual Alternates functionality to instantly cycle the alternates, providing a realistic handcrafted feel: just turn on the feature in any OpenType savvy application and let the music sound. Rather Loud brings yet another cool feature: lots of interlocking pairs that will add that nice extra twist when your projects ask for. Trigger the discretionary ligatures button or pick up your choices through a glyphs palette. I’d Rather Both, for sure! Marujo is a highly decorative typeface inspired by painted pieces of Arthur Bispo do Rosário, a striking Brazilian artist who lived for 50 years in a psychiatric institution. Bispo do Rosário’s works employs a multitude of materials and are often very intricate. Words are everywhere, painted or embroidered at most. He produced a vast amount of works, and is now – posthumously – widely recognized in Brazilian art scene. The psychiatric institution in which he lived is now a museum dedicated exclusively to his work. Marujo draws inspiration not only from Bispo’s works, but also from this man’s potency, a persistent man who produced amazing art locked in such a tough environment for a life-long. 12 incredibly creative fonts, perfect for adding artistic typography to your design work. Fonts are organised into carefully labelled folders, including web versions for all fonts. Deal includes extended licensing on all fonts, a handy .pdf browsing guide for navigating your new items. Deal includes 12 fonts. All fonts include web versions. Deal includes extended licensing. You can use these fonts within commercial projects and items for resale. You may not redistribute the fonts directly. Thanks for the comment on this one! Please don’t be sad about- i have popped you on the master list so if this bundle comes round again, rest assured I shall be in touch to let you know! Yay! I get a third chance. Third time’s a charm. Thanks for bringing it back and happy anniversary to you all. Haha, you’re very welcome Gabby. 🙂 Glad you managed to grab this. Hi! I purchased the 30 fonts deal yesterday and am having a bit of trouble downloading it. I am on the page where it says “Download your product” and i clicked the “30 best selling fonts – web font update” link. But the download has cancelled on me 4 times now, and the current download requires about 7 hours and seems to be increasing by the minute. Is this normal? I managed to download the help guide (250mb) with no issues and this file is only 244mb. I’d appreciate any help you can give me! Hey Lorraine, that definitely doesn’t sound right. Let me email you about this now. Rest assure we’ll get this all sported for you. Ah awesome! I’m so pleased for you. I’ve you miss out on any other bundles in the future, just drop me an email, and I’ll be sure to get in touch with you when it’s available again. I’m new to Design Cuts. I just purchased the Massive Patterns, Textures and Backgrounds Bundle, and you refer to this in the deal tutorial. OMG what a tease – I would have so bought this deal too! ARRRGH! I’m so sorry you couldn’t grab this deal, Elisha. While I can’t get you set up with this right now, I’ll be sure to get in touch with you as soon as it is available again. I purchased the last bundle deal and fell in LOVE with everything that was offered. I regrettably clicked on the past deals button and am devastated that I have lost out on all of the amazing-ness offered. If we are subscribed to the mailing list will we get updates on if/when deals may be re-run? No problem at all Kathryn. I’ll be in touch when this font bundle is available again. I love all these typography poster tutorials but unfortunately don’t have Adobe Illustrator. I use PSE 11. Would it be possible to create a tutorial specifically aimed at us PSE users, pretty please? Hey Carol, I know we do have a fair amount of PSE users in our community. I’m not sure if we can dedicate a whole tutorial to just PSE, however I’ll speak to Tom to see if we can add different options for PSE in the tutorials, or at least offer links to other PSE based tutorials. If you need something in the meantime, please just let me know what kind of resource you’re looking at using, and I’ll have a look, to see if I can find something suitable online. Hey Jana, we actually have a tutorial on how to use special characters and stylistic alternates in our tutorials area. You can find the tutorial here: https://www.designcuts.com/design-cuts-deals/using-font-swashes/ I hope this helps. hey, this is really a nice deal! any chance i could get this? thanks! I’m afraid the Inspirational Creative Font Collection is now well and truly finished, however we may bring it back at some point. I can’t tell you when this will be yet, but I’ll be sure to send you an email as soon as it is live and available again. Did I just miss this? :((( What an amazing deal! I am also interested in getting this deal. Thanks! I’m afraid this bundle is now well and truly finished. We do however re-run some of our deals as a bonus to a new one, so it may come back in the future. I’ll be sure to email you as soon as it is available again. Hi Guys! I am interested in this deal. Will we have a chance to purchase this again? Hey Brian, I’m just emailing you now about this :). Oh man…another one! It looks like this one was quite recent. Will this be offered again? Emailing you about this now Eleasha :). I’m glad to see that you’re enjoying our font bundles so much! Can I get this deal :(? Thanks for commenting Norah, I’m just dropping you an email about this now. Can’t believe I missed this! Any chance of getting the deal still? Hey Nathan, I’ve just emailed you about this. Please let me know when you rerun this! Facebook ran the sponsored post after the fact (!). Hey Dave, I’ll just drop you an email about this now. Ugh, I missed this too! Any chance on a late deal? I’m just going to email you, Andrew. No worries, Thai. I’ll just email you now. Hi I missed the deal on the creative fonts and accidentally re downloaded the wrong pkg “the gigantic vector elements bundle. Oops!!! (I already have that one!) Is it possible to get the creative fonts instead? Thanks for your help!!!!! Hey Toby, I’m just going to drop you a email about this. I missed the deal – Can I still get it? I’m just going to email you now, Cesar. I’ll just drop you an email about this, Stefan. Hi guys, this is an awesome bundle alright! I can’t miss this one. Will be purchasing tonight. Hey Leah, we will most likely re-run the Gigantic Vector Elements Bundle. I’ll be sure to get in touch with you as soon as it is live again. 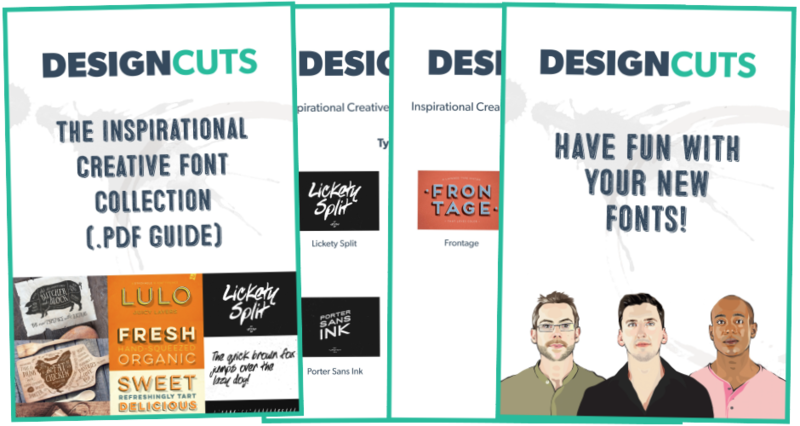 Should you see the Inspirational Creative Font Collection expired, when you’re trying to grab it, you can just drop me an email, and I’ll see what I can do for you. This fantastic pack is now mine. Alhamdulillah! I am looking forward to seeing some equally impressive tutorials that will show us some ways in which these fonts can be best used in projects. Keep up the GREAT work, Designcuts! This was a great tutorial. Very fun outcome as well. The fonts used here are exquisite additions to my constantly changing collection. Free fonts are nice to start out with, but you don’t get the flexibility that these fonts give you. Definitely a great bundle to work with. In the next few weeks I plan to buy a WordPress site template. I have viewed WordPress tutorials and created a basic WordPress site, but would say, this is really new for me. I want to use fonts from the Marujo collection in headers and content for a website. I see it says, “This font included web versions.” What does that mean exactly? Do the fonts look the same? Thank you. Hey Teresa, web fonts look exactly the same as the desktop fonts. The only difference is that they can be loaded directly into a website. So if you’re looking to use any of our fonts for your new website, you’ll be good to go. They’re basically just in a different font formats, so that they’re compatible with web programs, and such. I hope that helps. I am loving the ‘stacked’ font types that are becoming popular like Lulo. Thanks so much, Tom. Yeah the stacked fonts are definitely awesome, and so versatile. I absolutely love these font bundles … I have bought every one so far! You guys are seriously feeding my font addiction. I even have a ring binder with pages of font specimens printed out for each font, (all categorised by style of course!) so I can flip through and choose what amazing font I want to use next. I have too many fonts to remember otherwise… but these deals are going to cause me to require a big fat ‘Fontalicious Fun Binder’ No. 2!!! I love this font binder idea too. Do you have any links to pictures of it? I’d like to build something like this for our studio. I have just downloaded the massive artistic font bundle that I missed out on, I got the link from Tina posted above. It’s awesome. I just love your site and can not wait to begin meddling about with this pack. Thank you so much for the kind words, Paul. Sounds like it was a good idea to re-run the Massive Artistic Font Bundle. I’m really pleased you like it. 🙂 If you create something using your new resources, please do send us some of the designs. We’d love to see what you’re working on. I’m also missed and am interested in the previous font package. Please let me know if it becomes available again. We’re actually re-runnig the Massive Artictis Font Bundle at the moment, so you should be able to grab it here: https://www.designcuts.com/design-cuts-deals/massive-artistic-font-bundle-includes-web-fonts/. I’ve been craving a font bundle since I let many pass by. I saw the current deal and I without hesitation bought it. Then, to my surprise I saw the bonus option to buy the massive artistic font deal, and it was a great surprise. Now you’ve made me crave more fonts! Now that I have this two deals, is there a chance for an extra bonus bonus to buy the monster creative font deal?!?! That would be sweet! Do you not bring things back more than once? I understand, but New people discover you all the time and these people have NEVER seen any of the bundles. I doubt, if those who are regulars would mind. If they have them, they can just ignore the offer! Sometimes people are away, can’t buy during that period or whatever, or like me that time I missed one, when I first found you guys… I actually saw it when it was offered, but was not familiar with open type fonts. After sitting in on a class at @CreativeLIVE (via the web), I saw one of the fonts I rejected here, in the class demo. Suddenly I wanted it and realized the error of my ways, LOL. When it was offered again I grabbed it. OK, another gorgeous bunch. Now please can you stop it, I cannot resist! Haha sorry about that! I really hope you’ll enjoy all the fonts though. 🙂 Let us kow if you create anything with them. Will do… can anyone recommend a good font preview app for the mac? I’ve got hundreds of great fonts now and remembering what I have is becoming a problem! There are different ways of organising you’re fonts. You can use FontBook for instance, which is a great way of organising fonts. It can glitch sometimes, when instaling certain fonts through it, simply because it is impossible for every single font to be compatible with FontBook, but just a usual manual install will fix that. I also know that Adobe Brigde is a great program for organising files in general, however I’m not 100% sure how well it works with fonts, so FontBook, might be a better option. I hope that helps. That sounds really cool actually. Thanks so much for sending us the link. Although I think you will still need FontBook, in order to be able to make the sample script document. But sounds like a gret asset to orgaising your fonts. This will probably come out sounding like a weird question but I just wanted to be totally sure on the licensing. I know it says you can use these in commercial designs you intend to sell, but say I design a t-shirt and sell it myself, that is okay. What if that same t-shirt design is sold on a site like Spreadshirt, where you upload your design to make a commission on it every time someone purchases the shirt? Would this still fall within the licensing since Spreadshirt/site would be the one processing the sale? The font files themselves would not be transfered to anyone, just the design itself. Thank you very much, looking forward to more of your deals! Hey Chris, great question! Yup, that would be absolutely fine, as you’re not redistributing the fonts, or allowing them to be used or extracted by any third party. Once you create a t-shirt design, you’re free to do whatever you want with it. It’s the beauty of extended licensing :). I hope this helps, and if you have any other questions, please don’t hesitate to let us know. Thank you very much for the information! Tina told me you were really busy, so to get responses this quick really says a lot about you guys and what you do. I also have to thank Tina tremendously! She kept up with my emails and kept me updated. You guys are truly some of the nicest people I have ever come across online!! By far best customer service I’ve ever had! Thank you all again! No problem at all Chris, happy to help :). That’s a HUGE compliment, and really means the world to the whole team here. Thank you so much for all the support, and if you need anything at all, we’re here for you. I bought this set because of the fonts drawn by Tyler Finck. Really nice stuff, a superstar in the making for sure. Thank you so much Richard! I know you love your fonts, and I really hope that this bundle will be of great use to you. If you can show off any of your work, please do. We’d love to see some of your new designs. Hmmm… another font deal. And they look fantastic. Great for posters. And maybe some packaging items. I’ll just have to get this one in a day or two. Tom, you mentioned the possibility of some of the older deals occasionally being available again. Any chance that includes the 2 Lil Owls Creative Textures and Digital Papers Collection? I got the first one but wasn’t able to get this when it came around. If it does become available again, I’d love to get it. It’s Roz, I DO NOT work for Design Cuts. Just an avid Design Cutter who LOVES this community. I try to help when I am around and I know the answer (or think I do). Generally the return offers are related to the current offer. For example: This period’s offer is Fonts, so generally Fonts are offered as the return offers. But I too missed one of 2 lil’ owls offers when I first found this community and I got it when there was another 2 lil’ owls offer as it was offered as a return offer. You’re absolutely correct, Roz. We usually re-run an older deal that is in some way related to the new, current deal. So in this instance we’re offering a new fonts deal, which is acompanied by a bonus font deal, that was on offer some time ago. We also make sure to email the members who have shown interest in an expired bundle, once that deal is available again. I was pretty sure I was right, but one never knows. I remember when I first found you all I had missed one of 2 lil’ owls and also a font package. The font package I had seen, but did not understand about Open Type Fonts, so passed on it. After I watched a class on fonts, I saw my mistake and grabbed it the next time it was offered when another font deal was available. The 2 lil’ owls package came about when you had her products as the featured deal. By that time I became acquainted with everyone and the community and did not hesitate! It’s a good feature to bring back the older deals as bonus offers. And that is exactly why we’re doing it, Roz. We figured it’s an important feature, and helps some members, who may not have had the fund at the time, or simply missed it. Thanks, thought I was writing Tom. Small iPhone screens! Hey Lorraine. Thanks so much for the kind words! Let us know if you create anything with these new fonts. With regards to the 2 Lil Owls Creative Textures and Papers, they will most definitley be offered again, as they haven’t had their re-run yet. I’ll email you as soon as it is available again. Great, love to get it if I have the chance. Thx. As a young artist just getting started, I can’t express how much I love these font bundles it’s really helping me grow my resources and tools for doing my job ha. Thank you guys so much, this site and what you guys do is a godsend! That’s amazing to hear Caleb, and exactly what we want to achieve with these bundles. Fonts can be very expensive normally, so to see so many of the DC community benefiting from these more affordable bundles is always great. Keep up the great work, and please do feel free to send any new designs our way, I’d love to check them out. Thank you Julie, this is one of my favourites too :). I hope you have lots of fun using your new fonts. WOW! What a great offering. I’ve been eyeing a few of these lately and I am always excited about a font release from Yellow Design Studios. Cant wait to get my hands on this deal! I missed the last one you had but this just made my day. Thanks for the great review Randy, that’s wonderful to hear :). Ryan at Yellow Design Studios is a great guy, and we’re huge fans of his work too. Lulo is awesome to work with, so please do let us know how you get on, we’d love to see your work. Sometimes there is a second opportunity to purchase old “related” packages. So you might get an opportunity to buy the font package again! Thanks Roz! We definitely do do this, although for the last font deal, we’re waiting to hear back from one designer before being able to potentially offer it as any kind of private bonus for you guys. I’ll keep you both posted on this though. Yep, that should be fine Anna-Emilia :). Language support was a priority for us with this bundle, as we have so many nationalities within our community here. I’m glad the Finnish variations are useful for you. I’ll drop you an email about the previous deal and of course we can try to help. Thanks Tom for the email. But I’m actually more happy with this current deal, so I got it. Thanks! Awesome stuff :). We actually were able to re-run the older deal, so good news there. You should see the private banner for this in your account. I will be honest, I had to go through this collection a few times to take it all in. The variety of it all is quite fascinating, to say the least! Always love grunge, but… LOVE LOVE LOVE the polka dots and 3D effects. Some of the fonts give the impression that you can actually touch them ~as they are so raised off the screen! This absolutely a unique and outstanding collection. Quite honestly I’ve never seen these before! Trying to think how I can use them! BTW, it did not say specifically… Are the “Desktop” fonts included in the package as well as the Web fonts? To your creatively, but most of all… to your enjoyment! Thanks for the kind words Roz, this is one of my favourite deals too :). The variety is definitely something I wanted in this collection, and hopefully it will serve the DC community well across a range of projects. I love the 3D style fonts too, as they include so many alternate versions it gives you loads of creative control. Desktop fonts are most definitely included yes, the web fonts are also there as an extra bonus though. Oh, and the ‘Light’ font image is actually done entirely using fonts, no images, if you can believe it. The shadow effect and dotted text are all part of that particular font family :). I’m anxious to play with these fonts. Are they all done with the fonts, or are some done with images as well, where the fonts look raised/3D-ish? I was in Photoshop most of the afternoon, after a longgggg hiatus. I had a bit of re-acquainting to do, but it was great fun and VERY relaxing. Hey Roz! Amazingly the 3D examples are done entirely using fonts, as the 3D style fonts allow for so many styles to be built up, you can achieve some really incredible effects, without the need for images. I’d love to see the results of your afternoon Photoshopping :). The “Light” image appears to have a semi-transparent glow around the dots. Is that a setting? I can’t seem to re-create it. Thanks! Hey Leann, great question. The glow isn’t part of the font, but can easily be applied as a layer blend mode once you type out the text you need. Marujo has a range of awesome variations, including a solid font with dots, and a font that consists only of dots. By layering up variations of the font, and adding in your own layer blending options and layer styles, you can create some amazing results, without ever needing to use images. I hope this helps :).